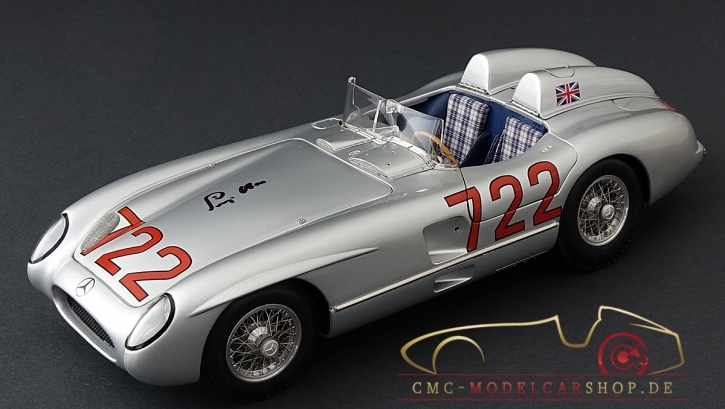 This allmetal model is a sincere tribute to the legendary Ferrari 500 F2, the world championship car of 1953. Hand assembled from 1,463 parts, M-056 is exactly detailed and feature the craft­manship and precision that make CMC miniatures so special in the hearts of collectors. Just take a look under the engine hood or remove the rear part to assure yourself! By the way, you can save your’re time if you want to know how many rivets are included on the gas- and oiltank. We already did that job for you. 526 single rivets were necessary to rebuild the tanks true to the original. The exhaust manifold is made of metal as wll as the heat shield at the cockpit entrance. 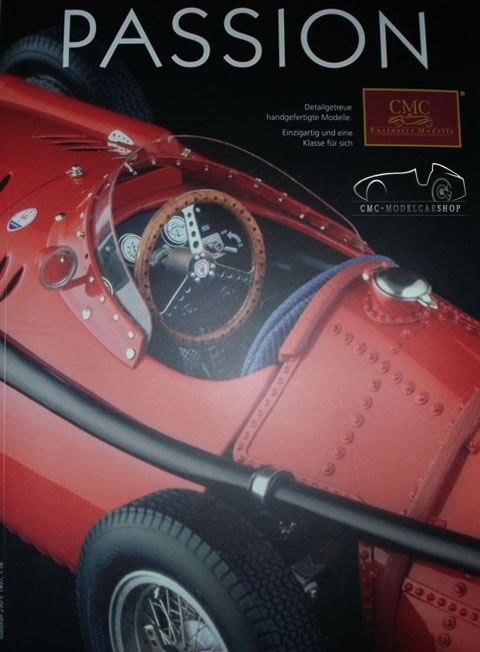 Description of the original vehicle: 1950 marked the inception of the Formula One World Championship. From Day One, Ferrari was involved in this highest class of auto racing, flashing a distinctive symbol of the small black prancing horse called "Cavallino Rampante" in Italian. In fact, Ferrari is the only F1 participant that has remained active ever since. Its record of successes is just as im-pressive. 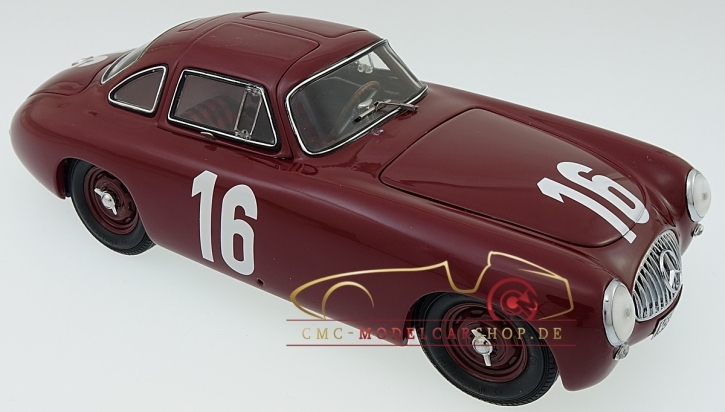 In 1951 Alfa Romeo – the toughest opponent of Ferrari – decided to quit the Formula 1 series. The rules for competition were subsequently changed so that Formula 2 racing cars were allowed to participate in the championship. Luckily Ferrari had already developed one – the 500 F2. The new car was light-weighted and compact in size. Other new features included a very low barycentre, wellbalanced distribu­tion of the aggregates, good brakes and high torque. Developed by Aurelio Lampredi, the 4-cylinder engine was capable of rendering 185 hp. All these gave the 500 F2 a superior manoeuvre and response to handling. But there was more. The driver of the 500 F2 was none other than the exceptionally gifted Alberto Ascari. It was not without reason that he was known as ”The flying Milan“. Ascari drove his 500 F2 to the title of a two-time world champion in 1952 and 1953. Other drivers such as Villoresi, Farina, Taruffi and the young Mike Hawthorn also contributed to the winning streak of the 500 F2. This legendary car virtually won everything there was to win during these years, hence its nickname “the Super-Ferrari.” With the return of the Mercedes and the rise of the Maserati in the 1954 season, Ferrari was faced with new cha­lenges. As a result, its winning streak came to a temporary end. One year later – in 1955, Alberto Ascari died of a tragic accident in Monza, and the whole nation of Italy was deeply mournful. Cette réplique de la Ferrari 500 F2 est très bien réalisée, on aperçoit très bien la structure du châssis, les éléments mécaniques sont bien reproduits. A cause de son palmarès CMC aurait pu faire d’autres versions.